Encourage total wellness by promoting healthy minds, bodies and souls. When you think of workplace wellness, what comes to mind? Running 5Ks as an office? Replacing the vending machine with fruit baskets? While those are both great workplace wellness ideas, a truly effective and well-balanced wellness program goes way beyond that. Encouraging physical wellness by subsidizing gym memberships and hosting pedometer programs is a great start, but it’s important to remember that “wellness” goes way beyond physical health. 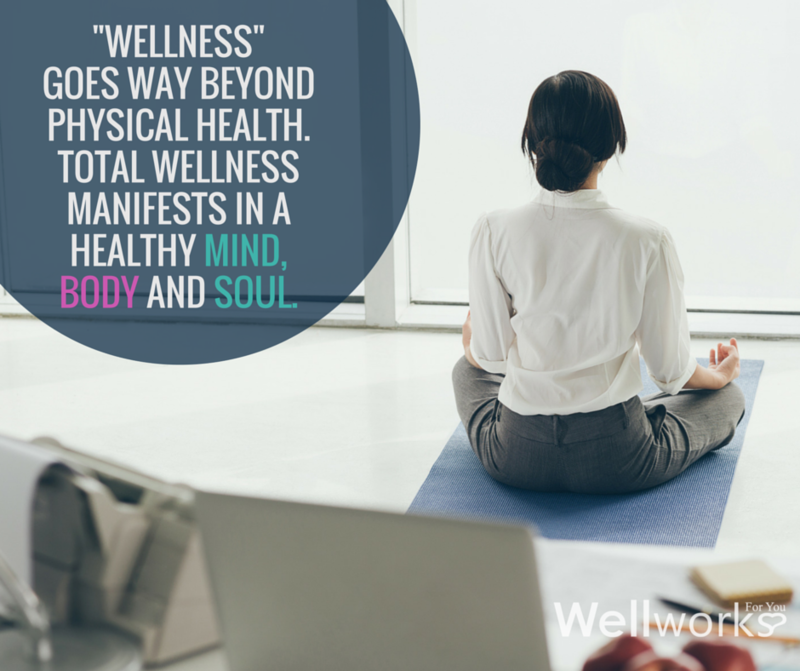 Total wellness manifests in a strong and healthy mind, body, and soul. According to Business Insider, we spend 90,000 hours of our lives at work – shouldn’t we make them as enjoyable as we can? Encourage a complete picture of health for your employees by nourishing every aspect of wellness. Host a Lunch and Learn: Bring in a speaker for a monthly Lunch and Learn. A health expert will come to your workplace to give a presentation and lead discussions on topics such as Smoking Cessation, Quick and Healthy Meals, Stress and Time Management, and more. Build a Wellness Wall: Go ahead and copy Tom’s Shoes – they have a “wellness wall” in their L.A. headquarters where employees are encouraged to post things like their favorite healthy recipes or a fun workout routine. Set Up an Office Library: Designate a bookshelf or two for a “library” of books lended by employees. Consider forming a book club if the library becomes popular. Get the News: Promote wellness in the workplace by signing up for a monthly newsletter featuring current health topics, fitness tips, and other wellness resources. Watch Your Steps: One of the most popular office wellness activities is the perennial favorite Pedometer Program. This program can be designed as a personal or group challenge. Map It: Create indoor (if you’re able, outdoor as well) “walking paths.” Measure and map out the distances through the halls and around the building to help employees meet their step goals. Stair Master: Probably the most common office wellness tip is “Take the Stairs.” But what if the stairwells are dark and boring? Launch a PR campaign for the stairs by making sure they are well lit, and jazz them up with fresh paint or artwork. Hold a “Grand Re-Opening” for the stairs with a “stair master” stair climbing competition. Kick-Off Your Meetings: Start or finish meetings with a quick round of group exercise. A handful of jumping jacks, a few squats, and some dynamic stretching should do the trick. Promote Volunteer Work: Encourage your employees to give back to the community by allowing an amount of time each month to leave the office early to do volunteer work. Go Green: If you’ve got to be stuck in an office all day, at least fill it with plants! There are numerous benefits associated with indoor plants, like fresher air and improved emotional states, but let’s not forget that they’re also just nice to have around. If you’re lucky enough to have outdoor space, start an office garden! What better way to promote wellness in the workplace than growing your own salad? Get a Pet: We’re not crazy – everyone is doing it. Having animals around reduces stress, improves the sense of community and connection. Be sure to take any allergies into account, and if this just isn’t practical for your workplace, take a company trip to the local animal shelter to walk and socialize with their dogs. Your office is basically your home away from home – you spend (at least!) eight hours a day there, so why not make it as “homey” as possible? A happy, healthy work environment is a productive one, and these workplace wellness ideas will certainly get you on the right track. Which ones are you most excited to incorporate? What would you add to the list? Let us know! Contact us today with your ideas, or to build a custom wellness program for your office.